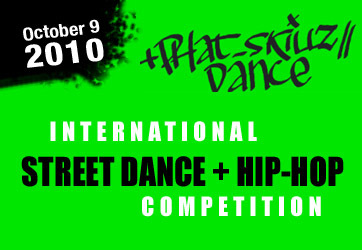 The annual International Street Dance Competition will take place this year on 9th of October in Ludwigshafen, Germany. Expect great shows and a huge variety of street dance forms. Gewinne ein Full-Access Ticket in Wert von 140 Dollar zu dem House Dance International NYC 2008. Mit dem All-Access Ticket hast du an allen drei Tagen freien Eintritt zu allen Contests, After-Parties und Workshops. Wenn dich Styles wie House Dance, Waacking, Vogue und Hustle begeistern, dann ist das der perfekte Zeitpunkt in New York City einzutauchen. DancerZone verlost insgesamt 2 Full-Access Tickets in Wert von jeweils 140 Dollar. Erfahre mehr über House Dance International NYC und wie Du die Free Tickets über DancerZone gewinnen kannst. DancerZone hat wieder was für ihre Mitglieder zu verschenken. DIeses mal könnt ihr freie Pässe zu dem Las Vegas Salsa Congress am 6-7. July 2007 gewinnen. Die Gewinnfrage ist, "Zum wie vielten Mal findet, das Las Vegas Salsa Congress statt? Lese weiter und erhalte mehr Infos zum Gewinnspiel und zu dem Las Vegas Salsa Congress. Falls du noch kein Mitglied bist, kannst du dich kostenlos bei DancerZone anmelden und mitmachen. The legendary West Coast Salsa Congress in Los Angeles is taking place on Mai 24-27 2007. The event of Albert Torres attracts world wide the best salsa dancers, salsa goups and salsa teachers. The whole salsa world will meet those days in Los Angeles! DancerZone gives you the chance to win one full pass with access to all workshops, shows and parties! And we ruffle another two evening passes, which gives you the access to all evenings. 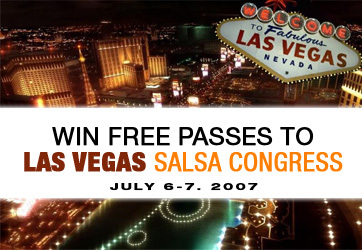 Get to know more about the 9th West Coast Salsa Congress and how you can win the passes on DancerZone. Win a full-ticket worth 125 € to the ART IN MOTION dance workshop in Ludwigsburg / Germany on 5-6 Mai 2007. You will be able to train with well known choreographers and take classes in Hip-Hop, Musical-Jazz, Modern-Jazz, Lyrical-Jazz, House, Partnering and more. DancerZone raffles 2 full-tickets worth 125 € each! take your chance! Get to know more about ART IN MOTION dance workshop and how you can win the full-ticket on DancerZone. Win a full-ticket worth 119 € to ODD Dance Camp 2007 in Hildesheim / Germany on 6-7 April. You will be able to train with choreographers and stars of YOU CAN DANCE. You can take classes in Hip-Hop, Street-Jazz, Modern, Afropop and Latin. DancerZone raffles 2 full-tickets worth 119 € each! Get to know more about the ODD Dance Camp 2007 and how you can win the full-ticket on DancerZone. Win free tickets for the 4th Mega Hip-Hop Workshop Tour or for the 1st Funk / Street Jazz Workshop Tour in March 2007. DancerZone raffles 5 x 2 free tickets! Get to know more about the workshop tour and how you can win the free ticket on DancerZone.